Just in time for the Mother's Day this year, I got this tag from Amy of Amiable Amy, thanks a lot gwapa Ams, greatly appreciate this. This is a good way to appreciate and thank our mothers who have done a great job in bringing us up. I adore my mother so much because despite of life's challenges, she never give up on us. Imagine raising 9 children with Papa and her not having a permanent job? I am not sure if I can top her courage, I don't even know if I can do it. But she courageously raised us with love and respect for each other. So I love you so much Mama! I wouldn't be here if it wasn't for you and Papa.. I'll see you soon, mwah, mwah! 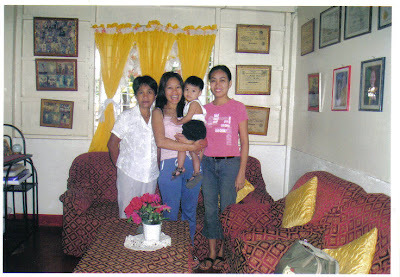 This picture was taken more than 5 years ago inside our shanty with my friend Haide and my nephew Noynoy. so guys if you want to honor your Mom, grab this tag and enjoy writing about your mother! When my husband arrived tonight, I felt so bad for him because he is very sick. He did not give us hugs or kiss and he jumped right into the shower because he said he doesn't want us to get sick too. My husband seldom get sick but when he does, it's bad. Oh boy, I am getting worried that our trip might get cancelled because of this, I hope not... Please pray for my hubby guys.. Alrighty guys, need to hit the bed now, goodnight and thanks for coming by my shanty!